Continuing with my madder dyeing last week. 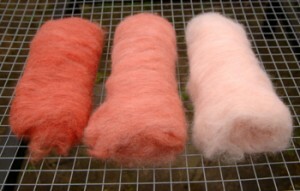 I used the same dye bath on three more occassions, each time producing a paler shade and each colour is very beautiful. The second dip produced a lovely bright orange – carded and ready to spin or felt. The third dip produced a slightly paler shade – again carded and ready to spin or felt. The forth dip yields a very pale and pretty pink colour. What a beautiful selection of colours produced from one dye bath. In total I dyed 450g of fibre. When fibres have been carded on a drum carder as above they are called batts. I will spin or felt them later in the year. The madder seeds I planted three weeks ago are just peeping through now, however I am delighted to say that the madder beds are really coming alive and have an abundance of new shoots emerging. A sure sign that spring is not far away. New madder shoots emerging – how wonderful! The woad seeds which self seeded last November are looking really good. I shall pick some this week and make my first woad bath of the year. See my woad page on this site. Watch this space and I will show you the results next week! Woad produces a wide range of fabulous blues and offers an alternative to harmful chemicals contained within chemical dyes. Woad is easy to grow and a great sense of joy and satisfaction can be gained by growing and using your own natural dyes. Woad seeds and dyes can also be purchased on this site. I would really like to encourage you to think about the clothes you wear. Quite often they are made by poor people, children or woman who are exploited. The fibres are often synthetic as are the dyes used which are really harmful to the environment. Do you know the textile industry is the main polluter of fresh water resources on our planet? I would like to encourage you to think about becoming more creative – maybe making your own clothes from natural fibres, learning the crafts of spinning, felting, natural dyeing, weaving or needlecraft. I would like to encourage you to manage your resources with extreme care and work towards a greener and more self sufficient lifestyle – which brings great peace, joy and a sense of satisfaction to our lives. Later in the year I am running a variety of workshops – check the website information if you are interested – or contact me if you have a question, view or interest. It is always a pleasure to talk to like-minded people. Copyright © 2018 Dyeing Crafts, All Rights Reserved.